Natural-looking glow. Gradual tan. 24hr moisturisation. Colour builds gradually. 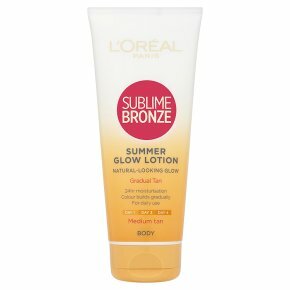 For daily use.Innovation Discover Sublime Bronze Summer Glow, a moisturising gradual tanninglotion which lets you build a natural, 'just back from holiday' glow day after day. Moisturising lotion: Enriched with Hydralium\, Sublime Bronze Summer Glow intensely nourishes the skin and leaves it moisturised for 24 hours, helping to protect it from dryness. Sun kissed glow: Enriched with a light dose of self-tanning agent to progressively build a streak-free, sun-kissed look day after day. Keep that beautiful holiday glow all year round. Soft, smooth texture: A velvety, delicately fragranced texture that keeps your skin feeling soft and smooth. Directions: Apply once or twice a day until the desired level of colour is achieved. Continue to use 3 times a week to maintain your sun kissed colour. Wash hands after application. Do not apply to the face. Does not contain sun filters and does not protect from UV light. Avoid contact with fabrics.